Engineers from the University of Freiburg, Germany have built a novel type of imaging system inspired by the human eye. It is claimed the technology could lead to new imaging instruments and microscopes for use in medicine and scientific research. Such devices would be used for detecting the early signs of skin cancer or help to provide early visual cues for food spoilage. The new imaging system is the first to demonstrate the imaging capabilities of focusing techniques that replace conventional, solid lenses with a combination of a malleable lens and a liquid, iris-like component. The researchers describe their new imaging system in a paper published in Optics Letters. Though the image processing that happens in the human brain and eye is complex, the mechanical apparatus is relatively simple. It consists of muscles that deform a stretchable lens to change focal length, the distance between the lens and the point at which rays of light are brought to a focus. The eye’s iris opens and closes to control the amount of light that can pass through the lens. But as engineers try to shrink the size and expand the capabilities of these instruments, the imaging systems they create become overly complex and expensive. Instead of using complicated mechanisms that require moving parts to tune the focus and adjust the aperture, the Freiburg researchers looked to the eye. ‘What we’re doing now is a completely different means of doing the tuning,’ said Hans Zappe, the Gisela and Erwin Sick Professor of Micro-optics at the University of Freiburg and co-author of the paper. For their new device, the researchers used two imaging elements that they had demonstrated previously but had never combined into a single system: a lens made of silicone surrounded by several miniaturised motors that adjust the focus by deforming the lens. ‘You can squeeze and stretch it just like your eye squeezes and stretches its lens to adjust its focal length,’ Zappe said in a statement. 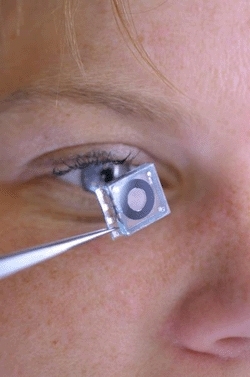 In front of the lens they included an iris-like component, which contains two liquids enclosed in a single flat chamber. One liquid is opaque and surrounds the clear liquid, forming a dark ring. Because the clear liquid is oil-based while the dark liquid is water-based, they stay separated. And since both liquids have exactly the same density, they remain in place even if you shake or rotate the device. Applying an electrical voltage to these liquids changes some of their properties, such as the way a droplet beads up on a surface. This behaviour – electrowetting – allowed the researchers to manipulate the liquid, expanding and contracting the dark ring to let in more or less light through the clear liquid at the centre. Zappe and his team have tested and characterised the optics of their device in detail, analyzing how much it would distort an image. Each of the two main components – the iris-like liquids and the deformable lens – can be designed to compensate for any aberrations in the other, resulting in better optical quality than would be expected if you were to consider the two components separately, Zappe said. While the new device may not be as good as the best conventional visual imagers, it is the ‘state of the art’ for a tuneable lens, he said. The cylindrical device described in the new paper is roughly three centimetres in diameter and five centimetres long, and although the researchers plan to shrink the design a bit more, making a miniature version isn’t their primary goal, since optical quality is inherently limited with smaller sizes. Instead, Zappe said, they hope to add more functionality. ‘What we’re looking at is to make really high-quality images where we have the ability to image things that a normal person wouldn’t be able to see,’ he said. Electric, Hybrid or Alternative Fuel Cars – Which Will Prevail?